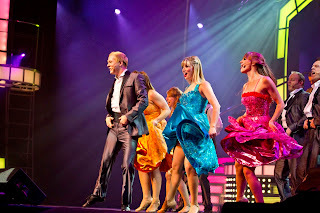 Smoky Mountain Opry is the largest musical variety show in the Smokies featuring Country, Pop, Broadway and Motown music, a huge cast of talented singers and musicians, and eye-popping special effects. The big stage at the Smoky Mountain Opry comes alive with mountain music, rock anthems, Broadway and movie tunes and country music favorites performed by some of the area's most talented singers and musicians. You'll be "Singing in the Rain" and "Stepping in Time" to some of Hollywood's favorite movie tunes, tapping your toe along with Garth and George Strait tunes, and you will watch incredible choreography performed by the skillful dancers at Smoky Mountain Opry. The singing and dancing is enhanced by beautiful costuming, fantastic props and staging and unbelievable special effects, including singers an dancers flying across the stage and over the audience. Then add in laser lights, pyrotechnics and incredible lighting and you have a live theater experience that you will not forget. The Smoky Mountain Opry is entertaining, exciting and is an experience that will be enjoyed by your entire family. You can buy combo tickets with other great Smoky Mountain attractions like The Comedy Barn, Hatfield & McCoy Dinner Feud and Magic Beyond Belief. Plan your Smoky Mountain fun at https://bestreadguidesmokymountains.com/ where you can get area coupons, information, maps and more! Smoky Mountain Opry is always a treat to watch. Such a colorful set up and vibrant atmosphere. I particularly enjoy the way the performers dress up.